Now that we started a new year and made a review of the last year we can happily say that we had a good year. We can also be thankful, that last year there was no funeral in our congregation but we had six children baptized and that means that our congregation is growing. Our congregational life is more active than ever and we are grateful to God for that. We have religion classes at school, bible study for the elderly, book club for young women, afternoon service and choir, religion classes here at the church. 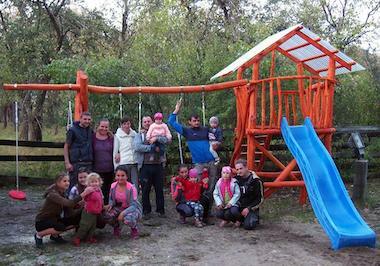 Thanks to your donation we could make a very nice playground for the children. Many parents came and help with the building. We always enjoy having you here among us, so we invite you this summer to come and try out the playground. The text from the Bible guiding our congregation this year is “and the peace of God, which passeth all understanding, shall keep your hearts and minds through Christ Jesus” Philippians 4,7. With this thought we wish you all a happy new year!